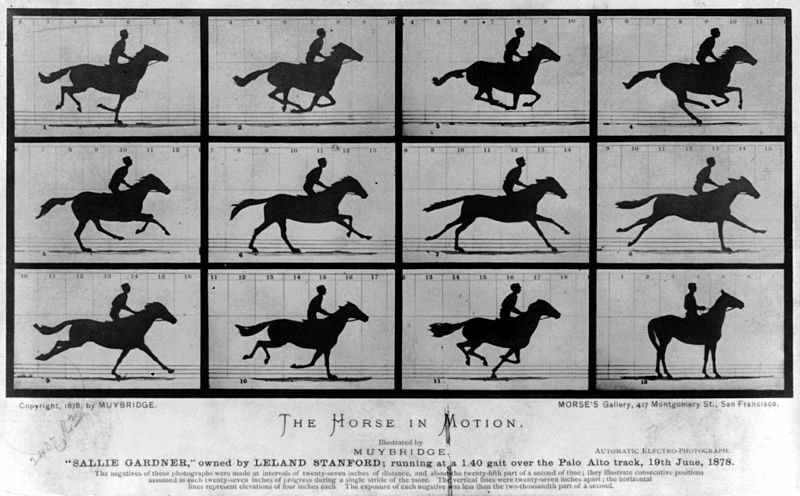 Based on these images alone, though, how do we know that the horse was actually running? 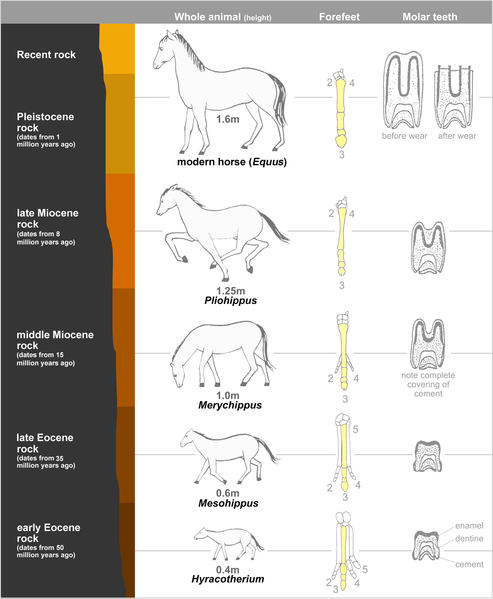 Couldn't the pictures have been of different horses? Couldn't they have been jumping and not running? 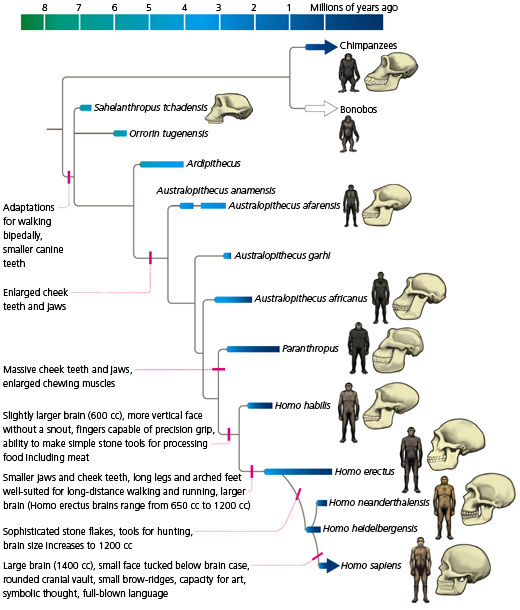 This is more than just a thought experiment. We're asking if it's justified to tie different pieces of information together to form a progression, just like we do in evolution. 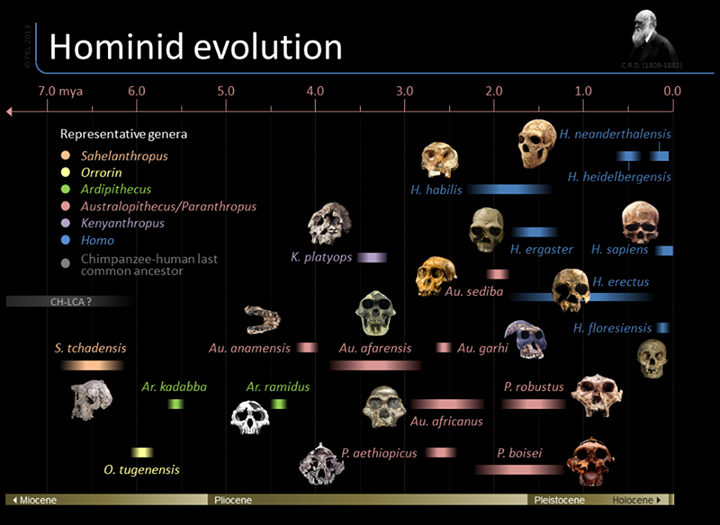 Below we will explore several examples of biological progressions and ask what evidence there is that they represent evolutionary change over time. 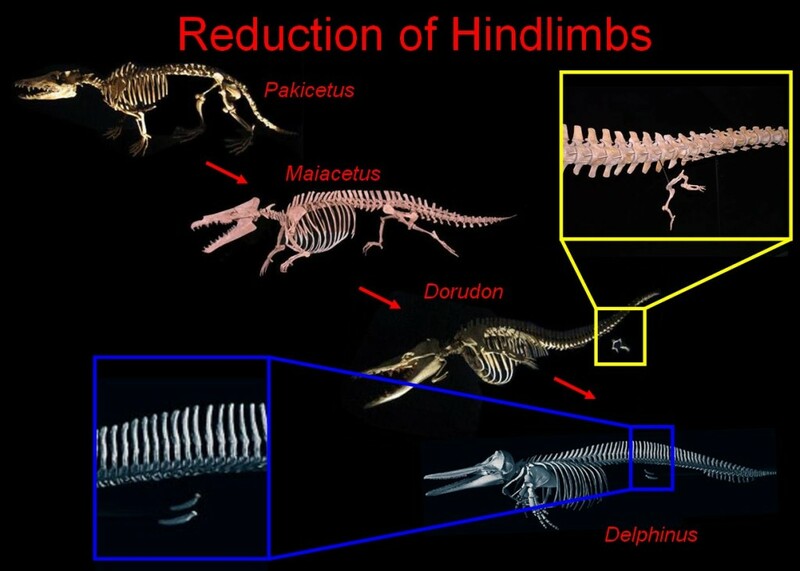 Prediction: If evolution is true and species have changed over time, then we would expect there to be examples of this preserved in rock strata, across geography, in a lab, or in recorded history. 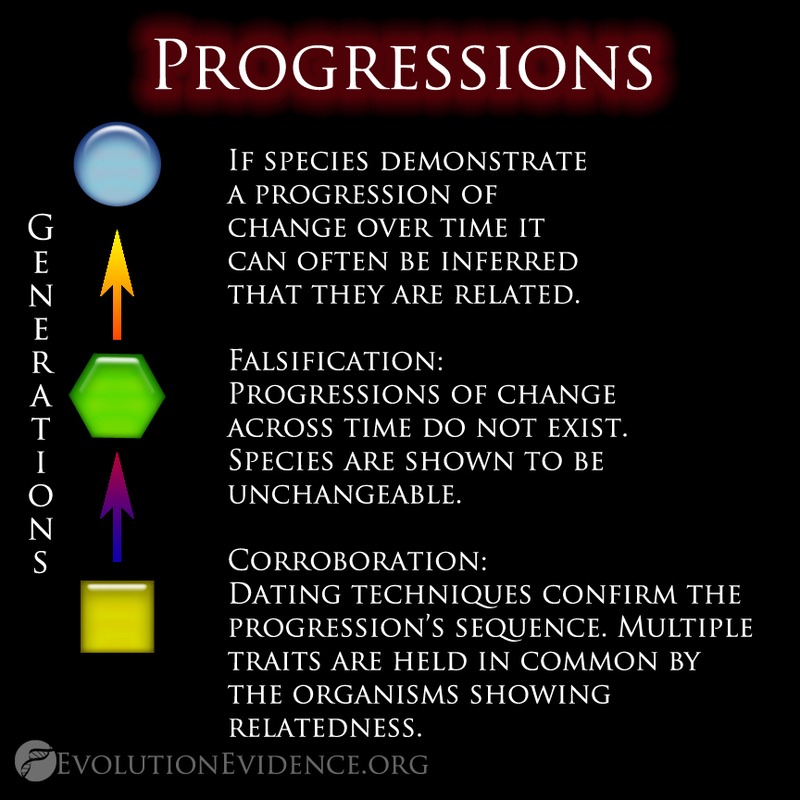 Falsification: Progressions of change across time do not exist. 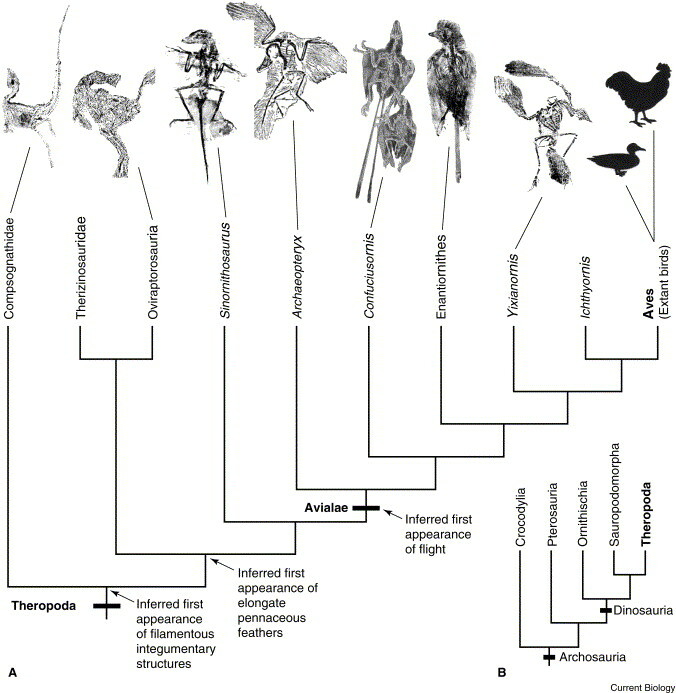 Species are shown to be unchangeable. 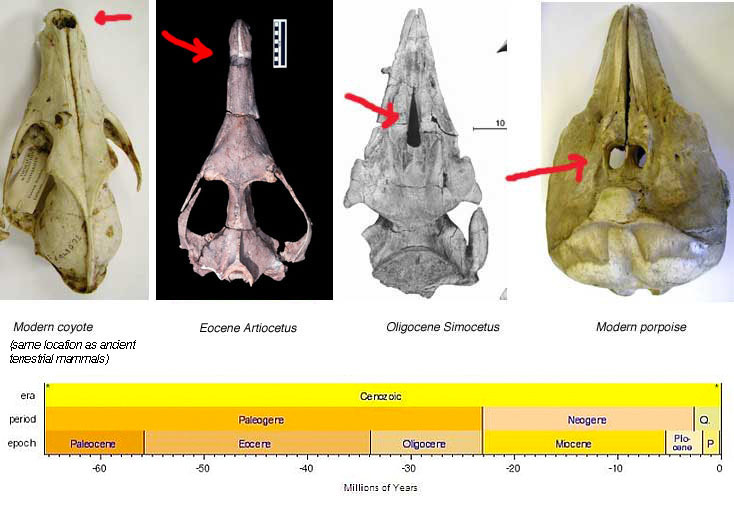 Observations: Fossil progressions, microevolution, biogeography (see examples below). Corroboration: Dating techniques confirms the progression’s sequence. 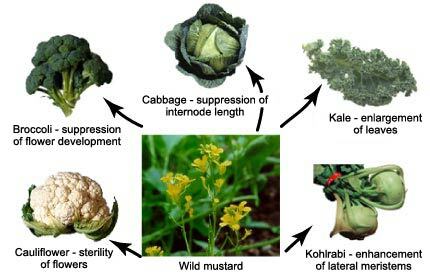 Multiple traits are held in common by the organisms showing relatedness. 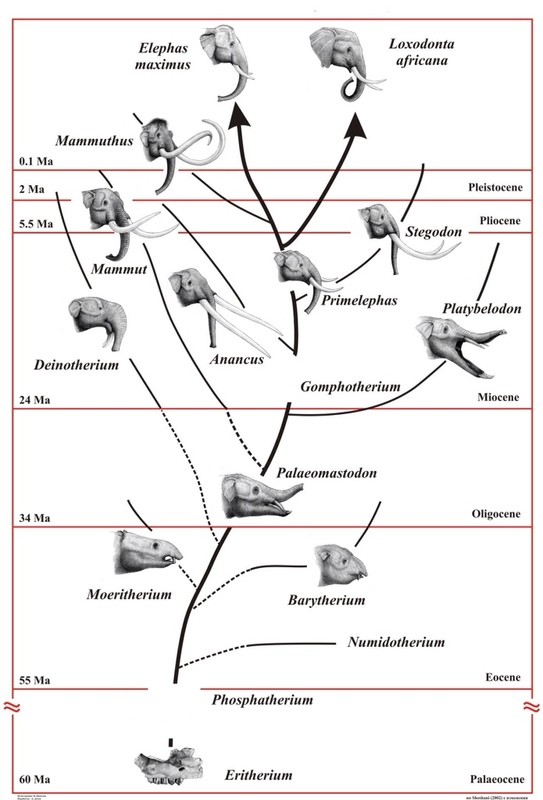 Inference: Provided with this gradual gradation in a trait we can infer that the species are related (though not necessarily direct descendants--evolution tends to meander). 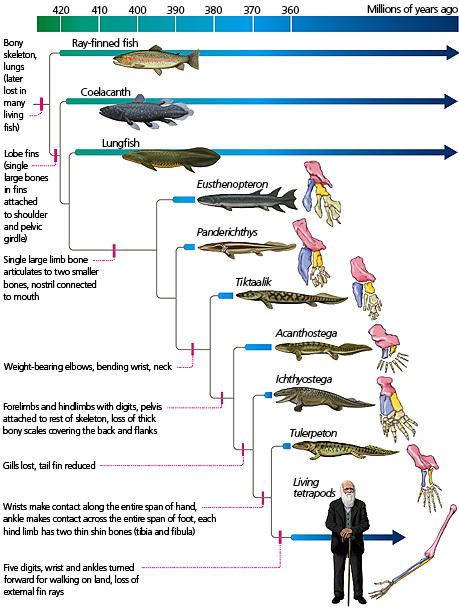 The fossil record demonstrates not only large scale changes across time, phyla, but also within individual species. 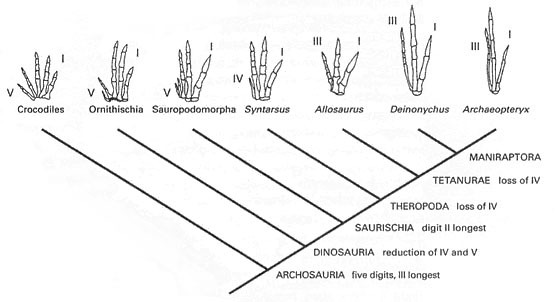 Three particularly important features are represented within the fossil record. 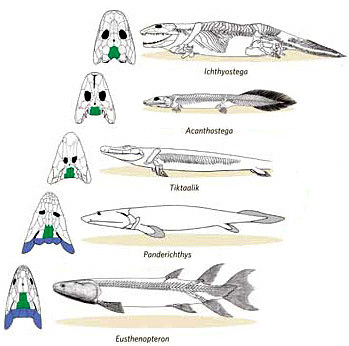 Firstly, the species represented within the fossil record are often vastly different from the life of today. 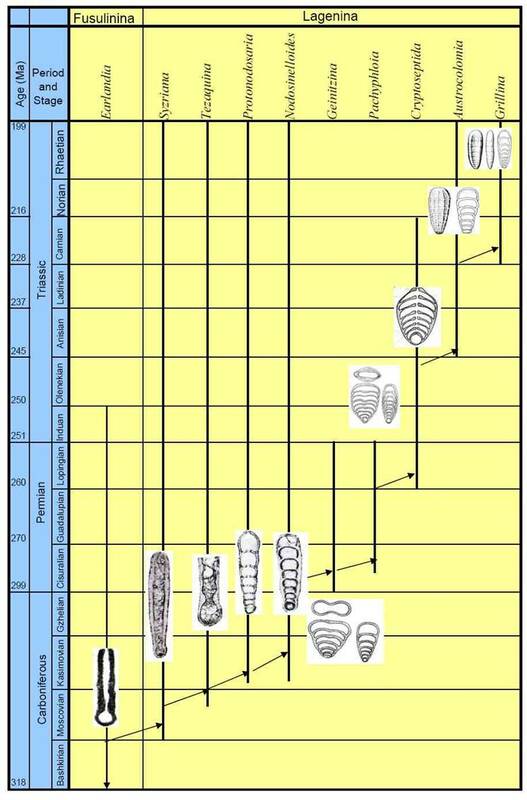 Secondly, is that the the fossils are separately and distinctly layered. 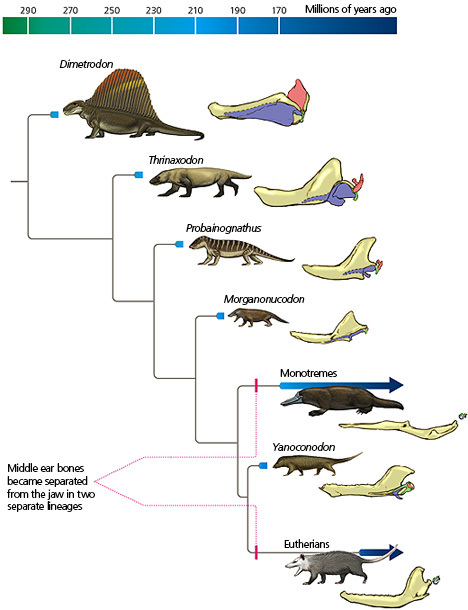 Meaning, that we don’t find rabbit fossils in the Pre-Cambrian layers, nor dinosaurs mixed in with mammoths. 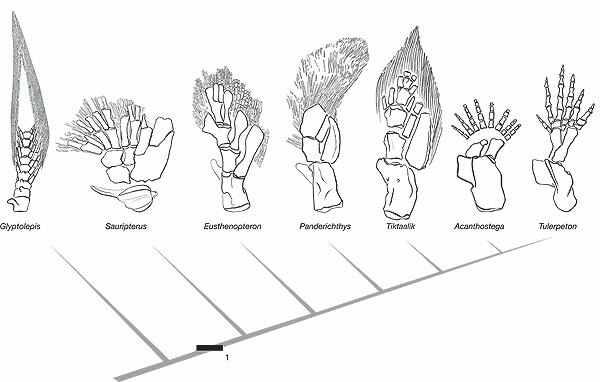 Lastly, both on the macro and micro scale of the fossil record we see trends of change that progress through time. 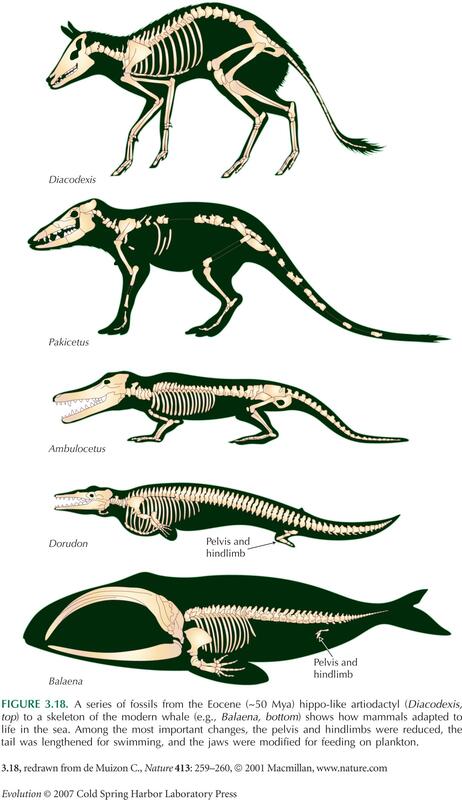 Individual traits such as leg/pelvis position, nostril location, and ankle bones can also be traced back to the early artiodactyls that led to modern day whales. 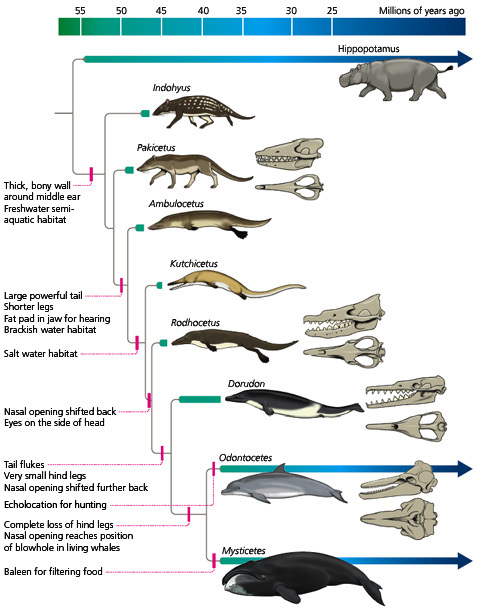 This is another image showing the homology between ancient whale ancestors (Pakicetus) and modern day even-toed ungulates (like pig and deer). 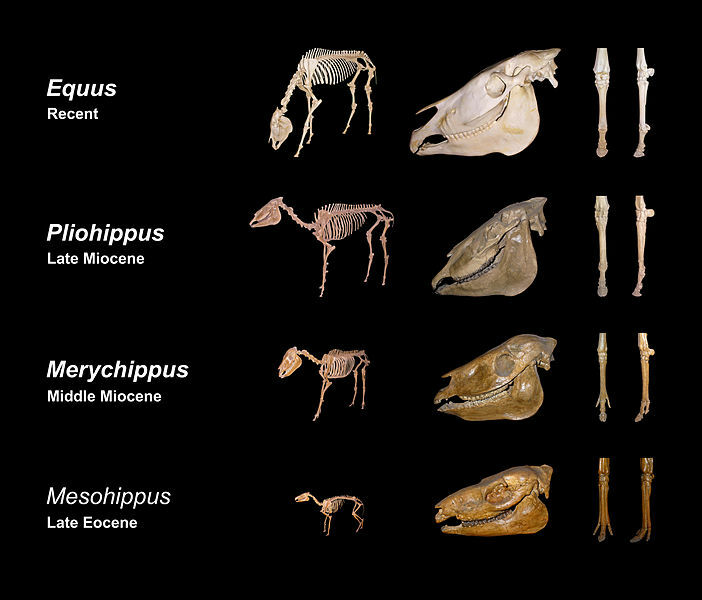 Dogs were included on the far left as a contrast typical of non-even-toed ungulates. 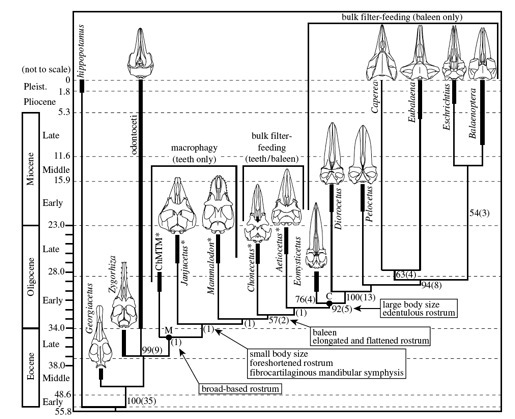 The transition from toothed whale to baleen whale also has left transition fossils. 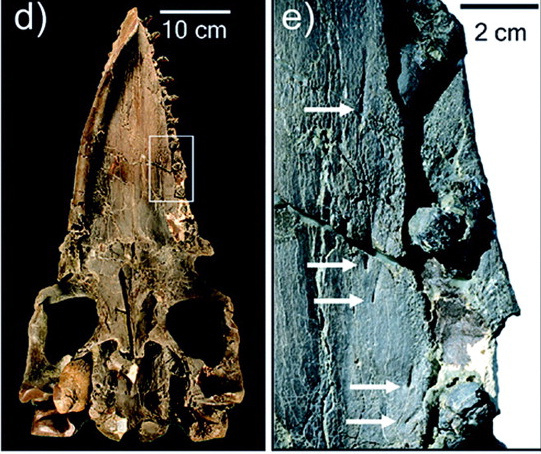 This can be seen in the pattern of blood vessels on the roof of Aetiocetus weltoni's mouth that are highly similar to those used today to nourish the areas that produce the keratin baleen. 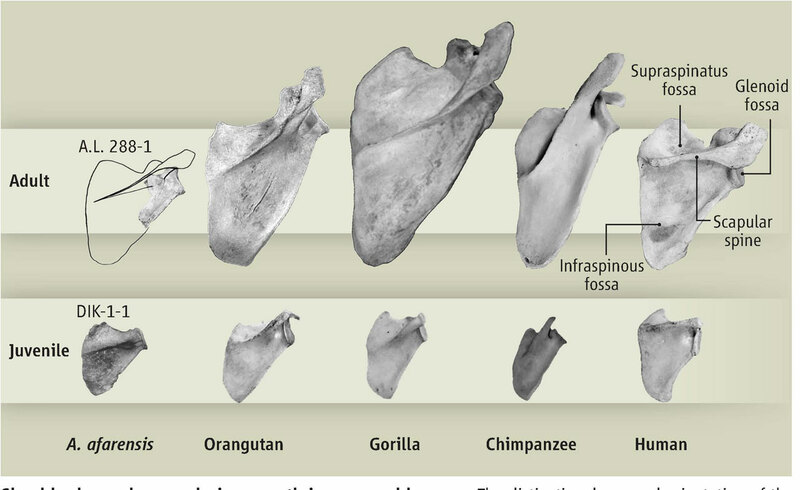 Notice the transition from long scapulas with oblique scapular spines good for arboreal climbing turned more horizontal as we began to climb and hang less. 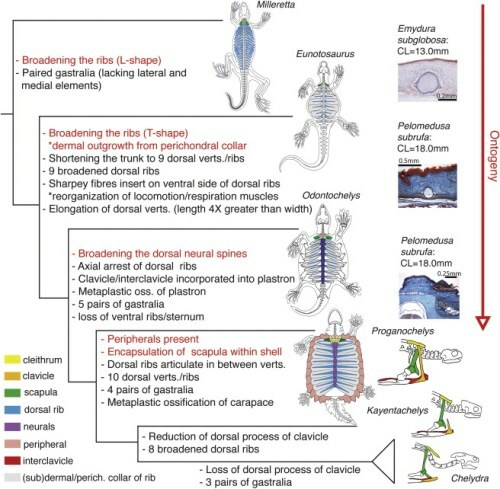 A common evolutionary strategy to change the phenotype of a species is to change the developmental progression that leads to that phenotype. 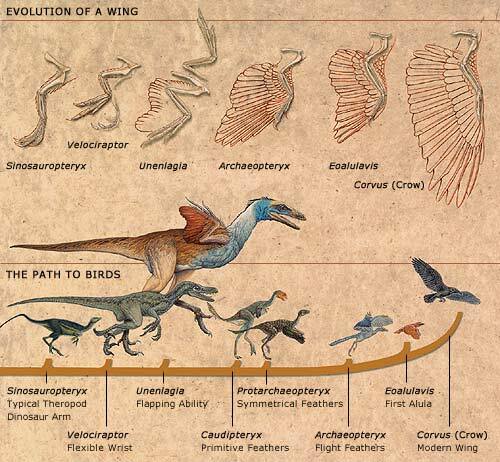 This diagram is showing how bird evolution progressed to have the adult phenotypes look like the juvenile phenotype of the ancestral species. 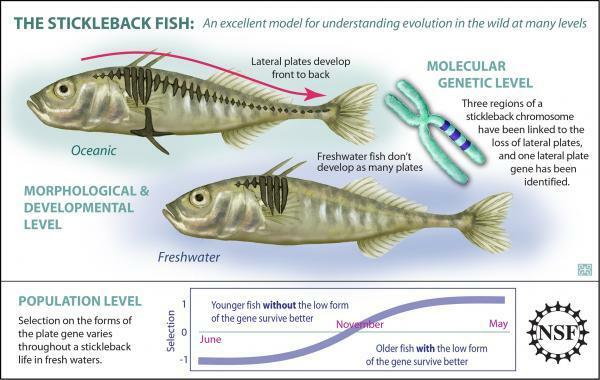 Summary: Put stickleback fish in a freshwater environment (they were transplants from salt water, but can survive in both) and over time they lose their protective, boney plates. They likely do so to conserve energy since their environment has different predatory pressures and less food during the winter. 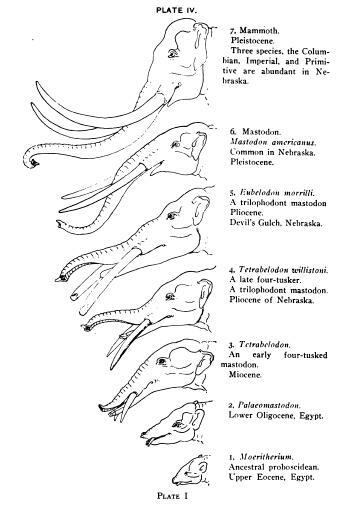 "Fig. 2. 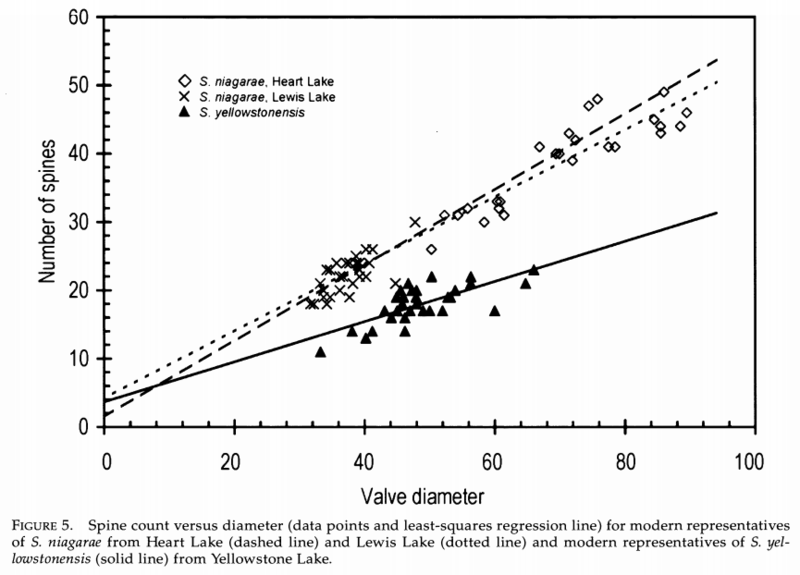 Evolution of lateral plate morph frequencies in Loberg lake between 1990 and 2007. 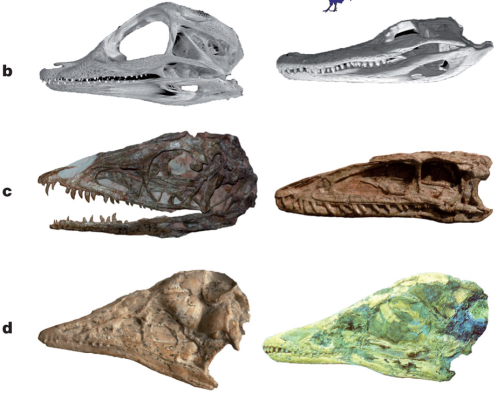 Besides complete and low lateral plate morphs, we recognize three intermediate phenotypes described in Bell et al. (2004). 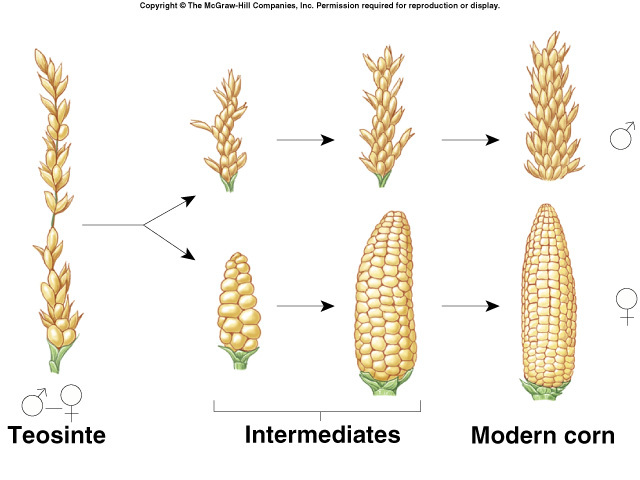 These are "intermediate partials"(IP), partial morphs, and "intermediate lows"(IL). 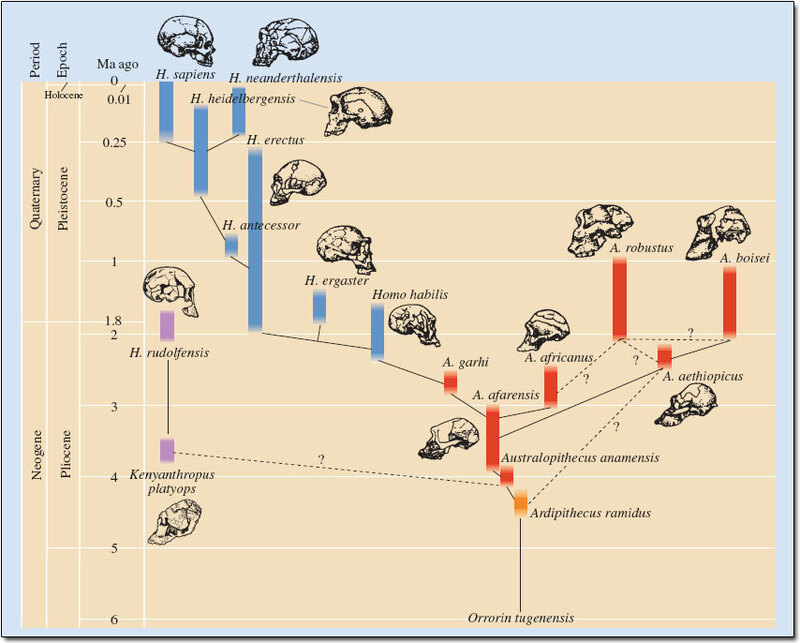 Notice that the frequency of the three intermediate phenotypes remained relatively low and constant throughout the time series." 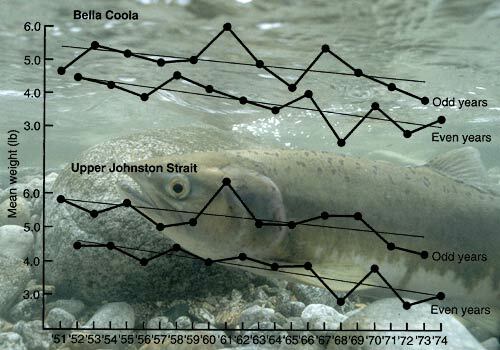 Pink salmon (Oncorhyncus gorbuscha) are getting smaller. Multiple reasons are possible but one is that fishermen have been consistently taking the largest, thus resulting in their reduced size through a form of artificial selection. 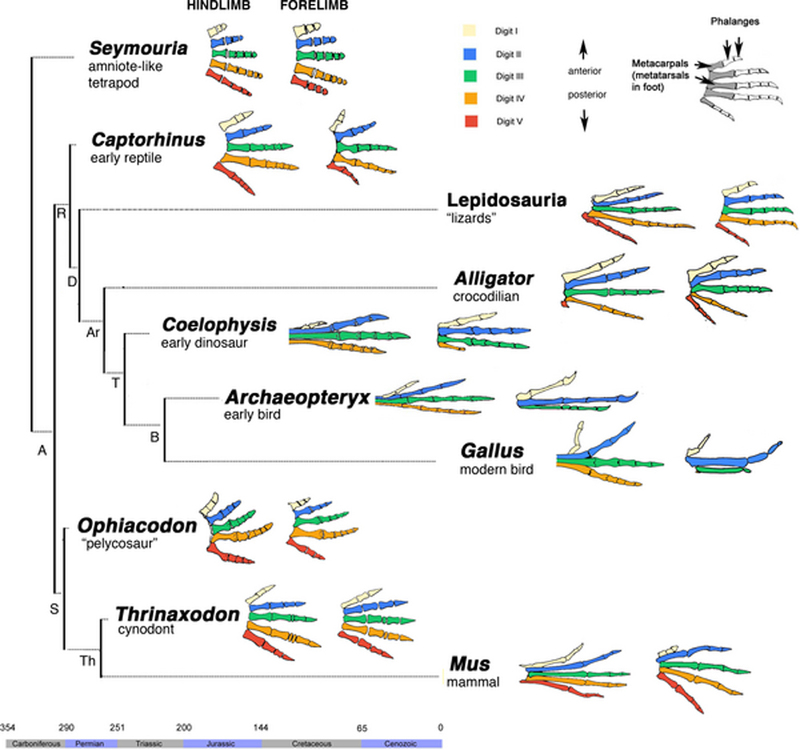 Bacteria: Because of their short generation time, bacteria are excellent subjects to use for evolution experiments. 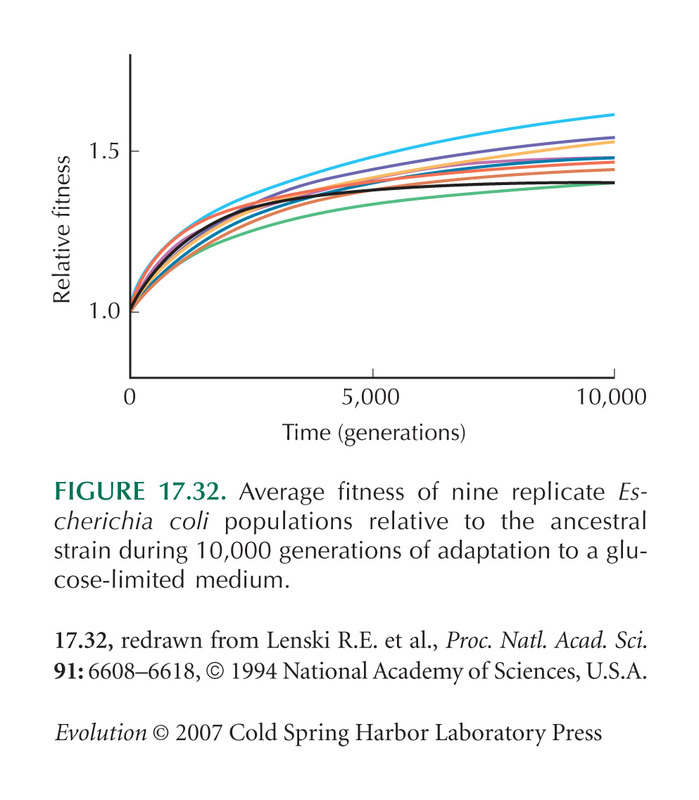 The longest running experiment is Richard Lenski's E. coli experiment. For some 60,000 generations the bacteria have been grown in a laboratory environment under controlled conditions and given very restrictive diets of sugars and nutrients. 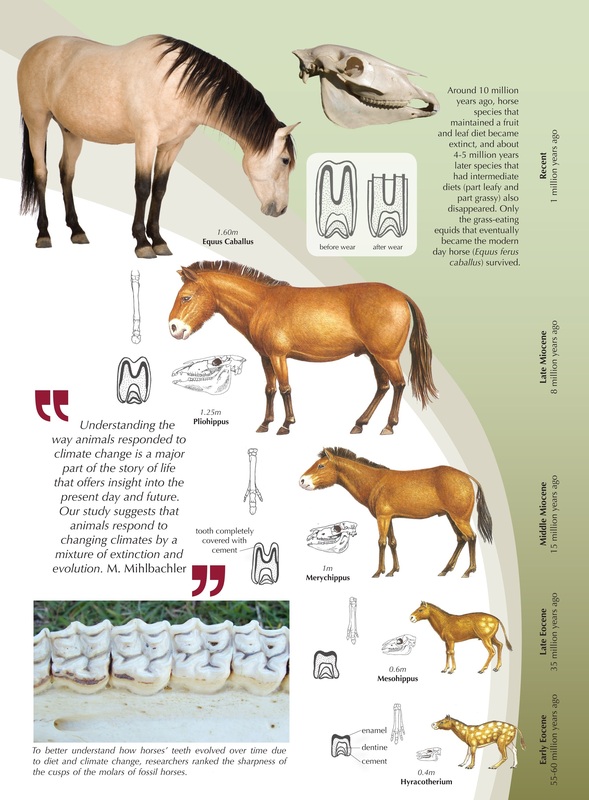 At regular intervals the bacteria are sampled, frozen, and DNA sequenced. 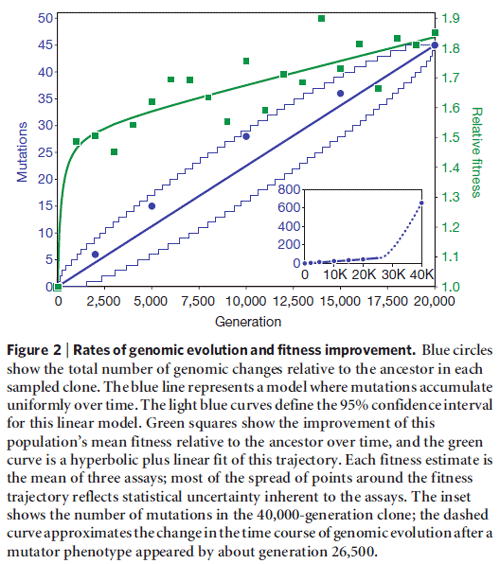 Population growth, fitness, and body size are tracked over time. 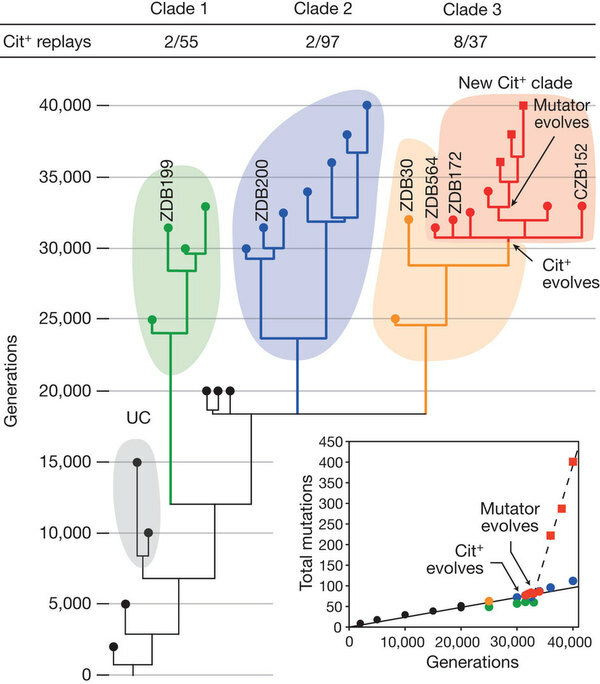 One of the most exciting finds of the study was the explosion of growth in one strain of bacteria that had multiple mutations that enable them to digest citrate in the presence of oxygen. This ability resulted in the doubling of their population within their beaker. Flat periwinkle: The European green crab was introduced to the North Eastern coast of North America in the early 1800's. These crabs started feeding on flat periwinkles by crushing them with their claws. 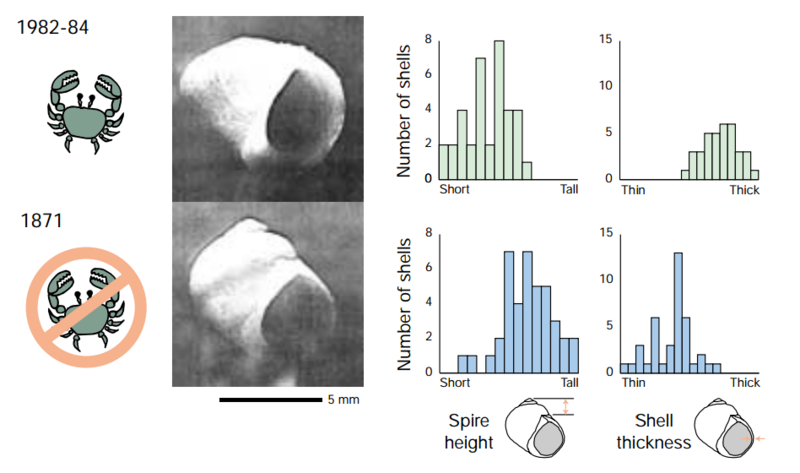 By comparing shells from museum specimens prior to the crab introduction to those of current day periwinkles a thickening of the shell was observed (conceivably due to the crab predation). 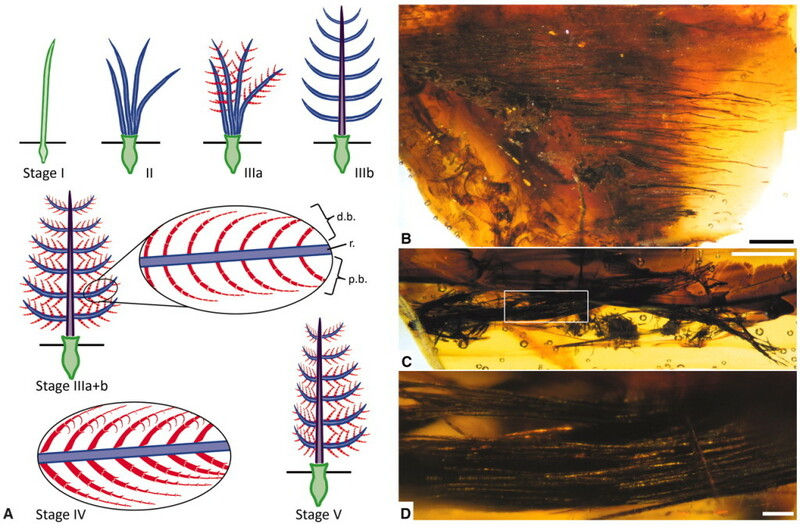 Subsequently, the natural selection process of thin shelled periwinkles was replicated in an experimental setting. 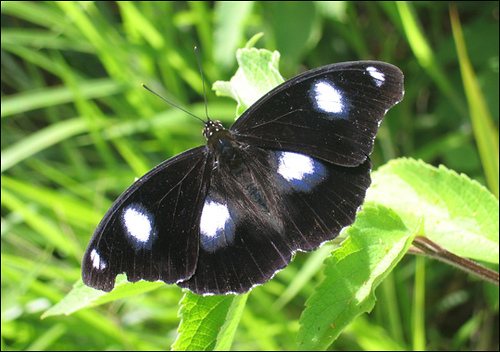 Samoan Blue Moon Butterfly (Hypolimnas bolina): A parasite common to arthropods called Wolbachia is passed through the female line in the egg. 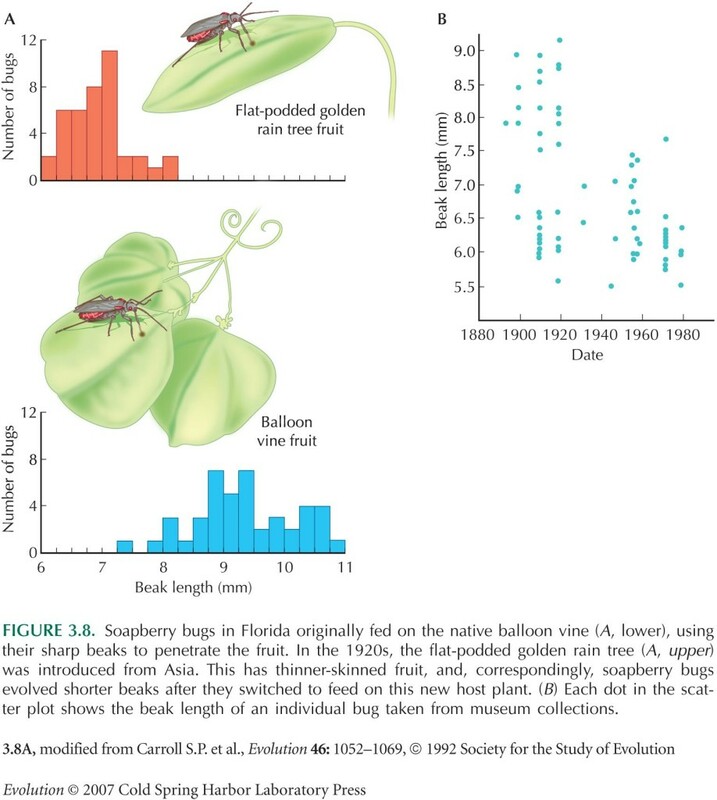 To increase the parasite's chances of getting into the next generation of butterflies the parasite was killing off males. This resulted in a drastically skewed population distribution with 99% of adults captured being female. Over 4 years and 10 generations of butterfly the population re-established equilibrium with a 50:50 ratio of female to male. 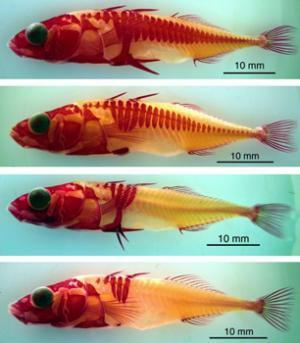 Researchers believe this is due to the evolution of a repressor gene that inhibits the Wolbachia's biochemical attack. HIV: At this time the most common treatment for HIV are drug "cocktails," which are the combination of multiple drugs that combat HIV. Isn't that a waste to use multiple drugs to fight one condition? Not when evolution is taken into account. 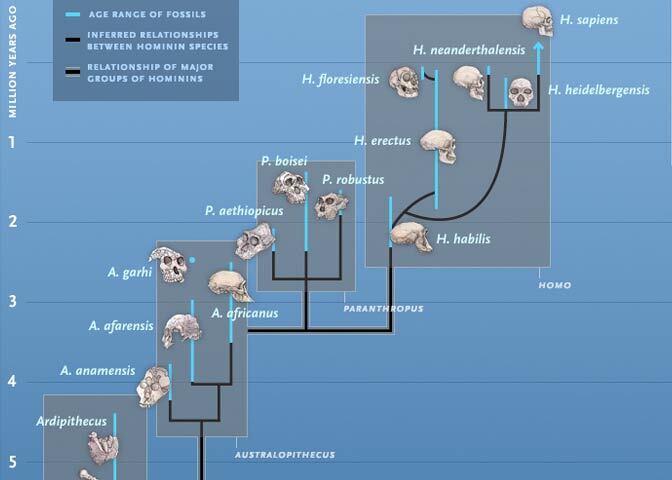 HIV evolves incredibly fast for two reasons. 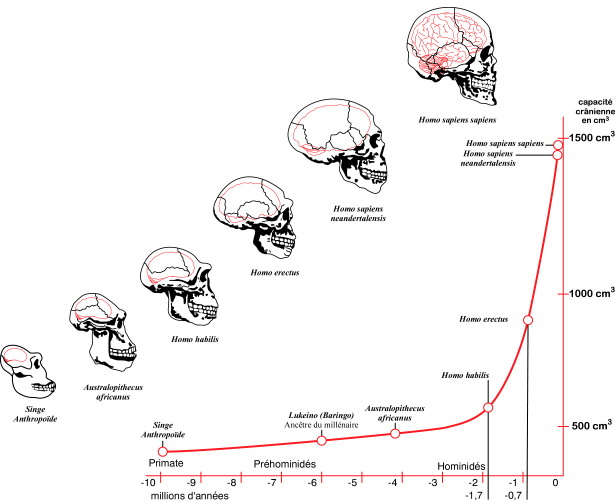 1) It's high population within a human, numbering far into the trillions per individual. 2) It's use of a error prone reverse transcriptase to copy its genes. 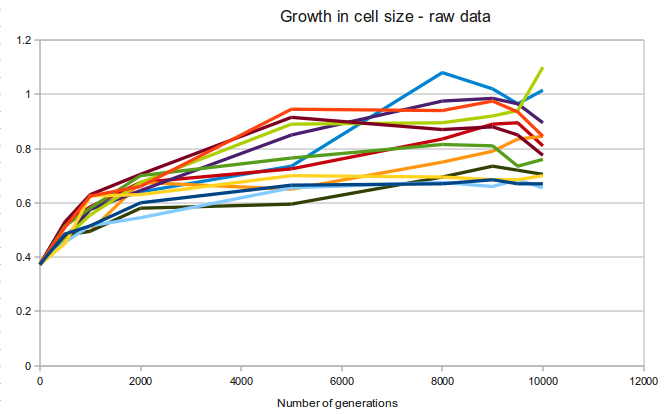 This essentially is the perfect storm of drug resistance evolution. 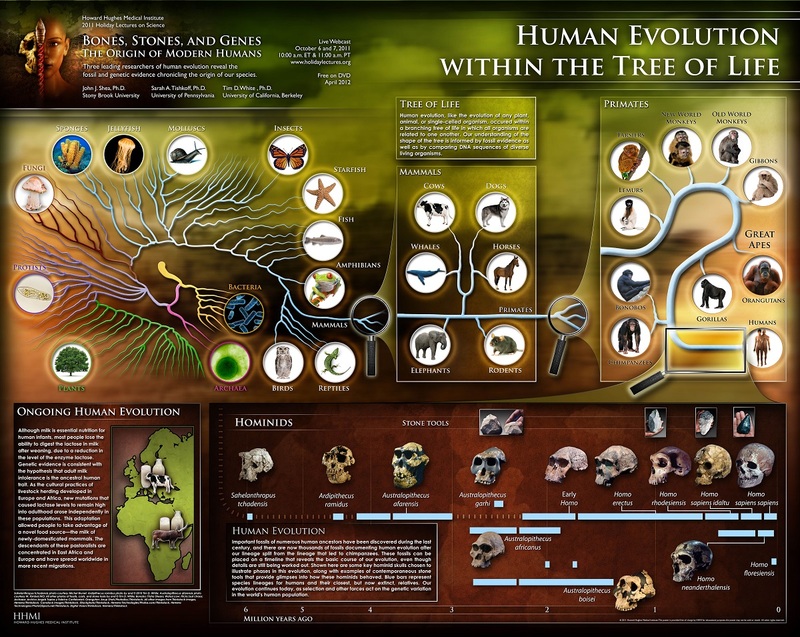 That being the case, the current strategy is to overwhelm the HIV virus making it necessary for it to evolve multiple adaptations at the same time--a feat that is difficult but not impossible and the drugs only currently delay the process of evolution. 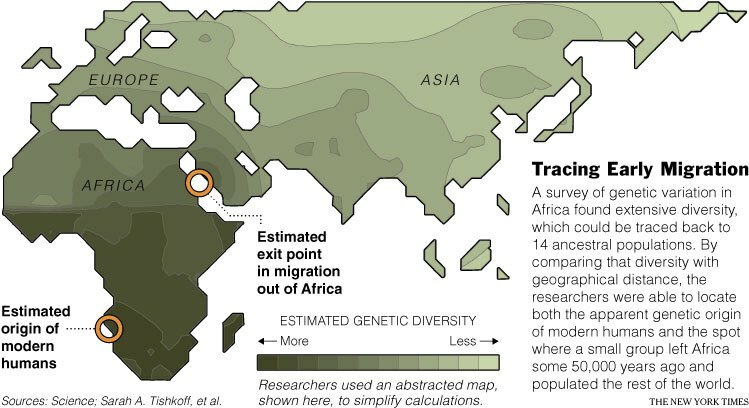 Biogeography: Because migration can be difficult and take time, biogeography can spatial represent evolutionary change over time. This phenomena is most obvious in 'ring species' that start spreading slowly over many generations around geographic obstacles, like mountain ranges. 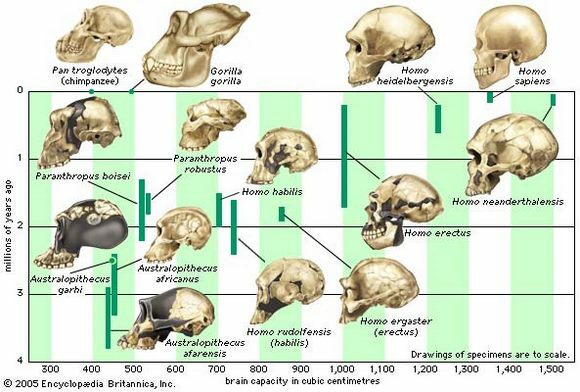 The population diverges into two as it spreads around the geographic obstacle and by the time the species meets again on the other side of the obstacle so much time, mutation, genetic drift, and selection has taken place that the two species can no longer interbreed. 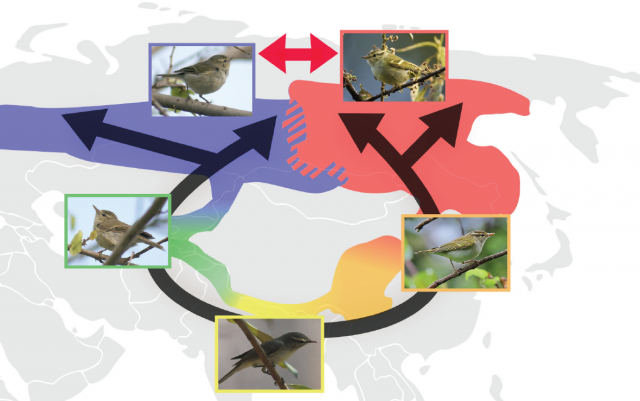 Even more interesting is that the two separate species can interbreed with those geographically closest to them from the direction that they migrated. 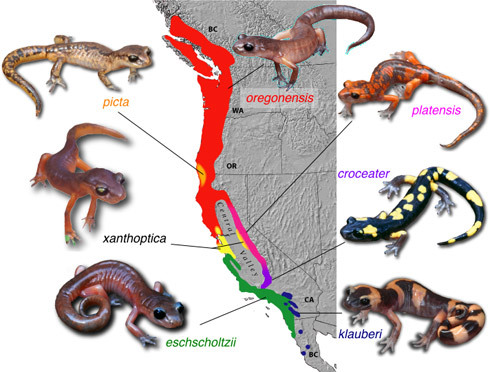 Ensatina salamander of California - The species spread from the north and traveled around the Central Valley and diverged into species that can not mate with each other in the south, due to their divergence, but can mate with the species in the direction that they migrated from. The Greenish Warbler (Phylloscopus nitidus) historically spread around the Himalayas and can interbreed with those from the direction they spread but not those that long ago diverged from them and spread around the opposite side of the mountain range. The Larus Gulls of the Northern Hemisphere: Notice the darkening of the feathers in a clockwise direction starting at the bottom. 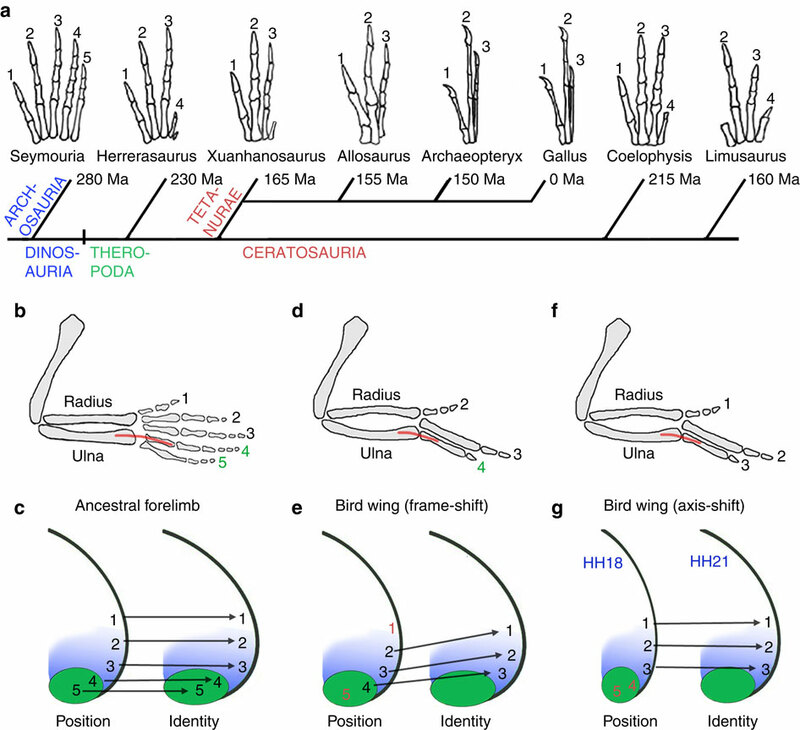 Gull species near each other can interbreed, except between the Herring Gull and the Lesser Black-Backed Gull that diverged from each other long the longest ago. 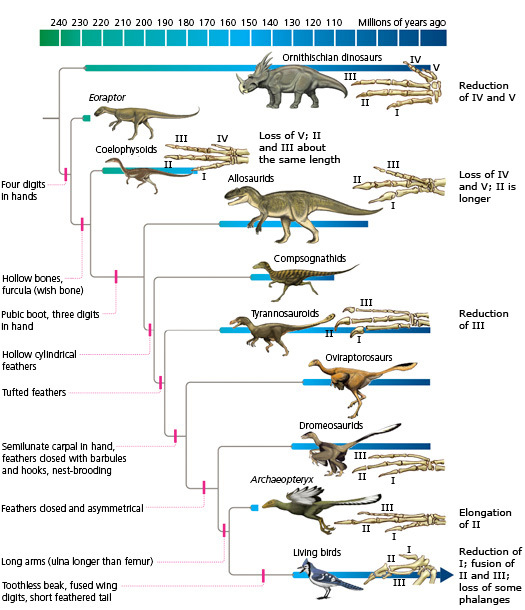 This inability to breed tells the story of how the species likely spread overtime around the world and met back up, now no longer able to interbreed.